Michael Holliday had a method of crooning that was heavily influenced by and similar to Bing Crosby; although his overall style was probably closer to that of Perry Como. Michael served in the Merchant Navy during World War II, having been born into a seafaring family. On a 'stop-off' in New York, Mike took the opportunity to enter a talent contest at Radio City Hall- which he won. This gave him the confidence to try and become a professional singer and he began by offering his services around Liverpool's dance halls. His first important professional work came as a member of the Eric Winstone Orchestra. From this he soon became a top performer during the dying days of the Variety theatre and drew sufficient attention to get into Television and records. 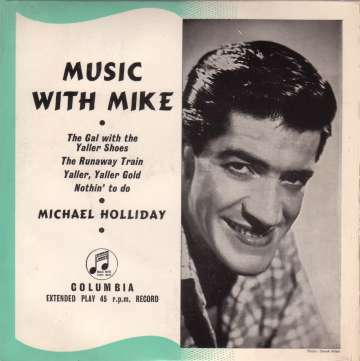 The EP illustrated on the left (SEG 7683 "Music With Mike" published 1957) was the second of no less than sixteen that were released on that format in the UK during Michael Holliday's lifetime. It includes the track, 'The Runaway Train', a number which was- and still is- popular among the young of all ages. It is very difficult to find that track on 45-rpm, so if you are looking for it (for the kids, of course) then finding a copy of this EP might be a good way of doing so (no, my copy isn't for sale, er- I'm saving it for my grandchildren!). Mike's career peaked during the late 1950s at a time when it was common for multiple cover versions of the same song to be released. In these circumstances, as often as not, it would be the Michael Holliday version that would succeed; such was his popularity. In fact much of his recorded output, in common with other British MOR artists, were covers of American songs. He also hosted his own TV series and was one of the first to adopt a 'relaxed' style as used by Val Doonican a few years later. Sadly, despite his popularity as a performer, his chart presence was erratic and the 1960s brought a long series of failures. Michael Holliday died from a suspected drugs overdose on 29th October 1963 in Croydon, Surrey.